You are here: Home / Articles / How Can We Fix Erosion On The Coast? How Can We Fix Erosion On The Coast? 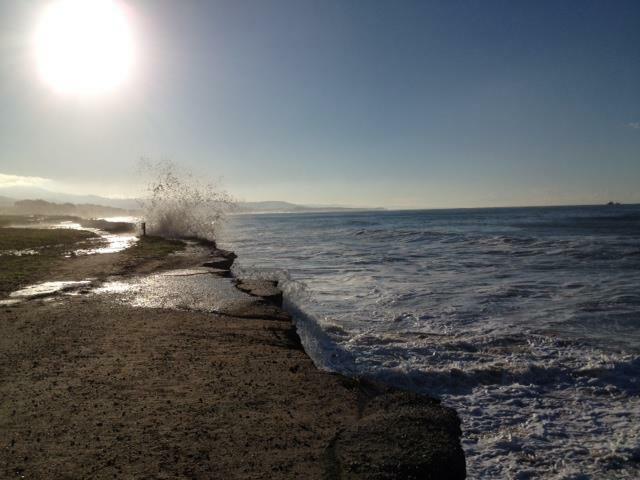 Have you ever wondered what is causing the exponential erosion of the Half Moon Bay coast? Most of us attribute it to El Nino or maybe global warming, but there is very likely a man-made cause: the harbor breakwater. The Pillar Point harbor breakwater was completed in the 1960’s when the study of environmental ocean hydrology was in it’s infancy. In fact, faulty breakwaters are endemic across the United States, forcing most harbors to dredge, or relocate, the sand that can’t pass the breakwater. If the harbor isn’t dredged, two things happen. One, the sand builds up overtime, making the harbor shallow and eventually dangerous for boats. Secondly, and even more importantly, it keeps sand from reaching and replenishing the beaches south of the breakwater. Beaches protect the land, and without a constant source of sand the waves start to erode the land, causing problems like the ones we are dealing with today. El Granada in 1972. Look at that big triangle of land that is now completely eroded! So, what’s the deal? 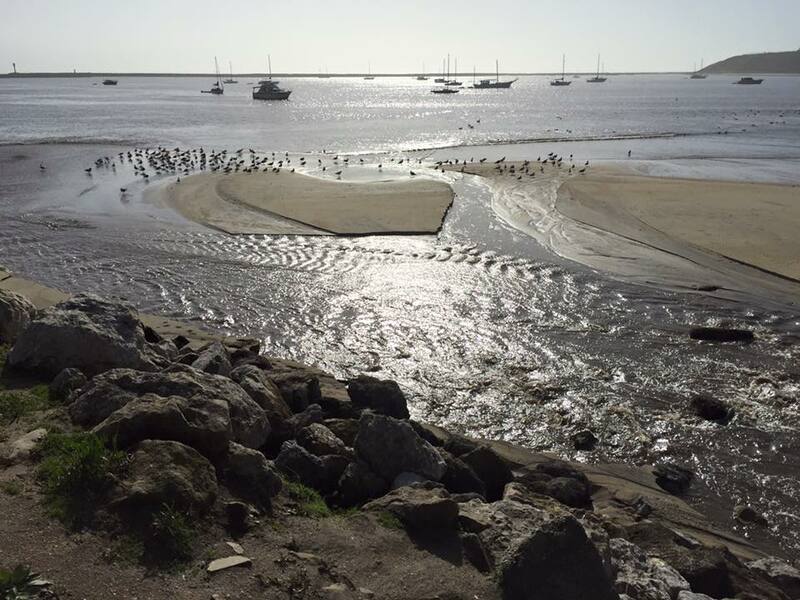 Why isn’t Pillar Point Harbor being dredged? 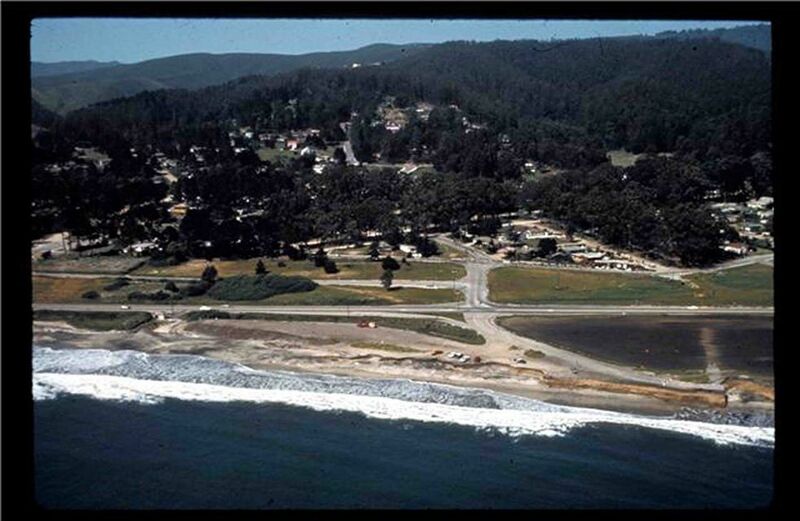 The Monterey Bay National Marine Sanctuary placed its boundary around Pillar Point in 1992, making dredging receive the same penalty as killing endangered species or drilling for oil. Yet, every other harbor in California is dredged, including Monterey Bay. Deer Creek, one of four that run out of the mountains into Pillar Point Harbor, creates over 3,000 tons of Montara Mountain granite sand in an average year. This is considered excellent quality sand that will stick to the clay shoals and help prevent further drastic erosion. Our beaches need this sand nourishment if we want to have any beaches left at all for our community to enjoy. To learn more about this issue, click here for a study done by a SF Environmental Hydrology Firm, Philip Williams & Associates. Information, photos and study courtesy of Brian Overfelt.